The glow of multiple polka dots in your choice of sparkling foil wraps your wording in warmth and beauty. The background of these response cards is printed in your choice of color. 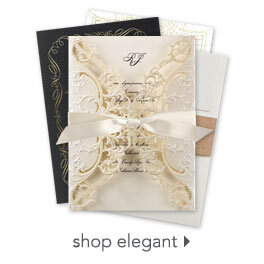 Personalization Options: Background is printed in your choice of color. Polka dots are printed in your choice of three foil colors. Your wording is printed in your choice of fonts and colors.